Warehousing Equipment have released the Powered Pushmate, a new battery powered trolley, delivering both workplace efficiency and ergonomics. The powered pushmate has a large 500kg carrying capacity with a 1200 x 700mm deck size that can handle large loads. Manually pushing loads over a large distance is outdated. The Powered Pushmate works on 24V DC motor and the sealed transaxle delivers a variable speed up to 4kmh and a range of 8km. 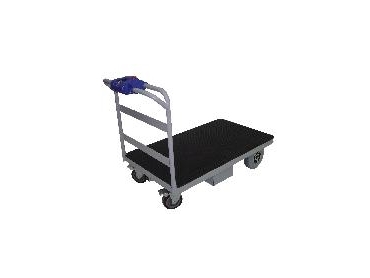 Safety features of the Powered Pushmate include reverse alarm, braked motor, lockable rear castors, ergonomic handle height and anti slip platform. The future of manual handling has just been made easier with the introduction of the Powered Pushmate.